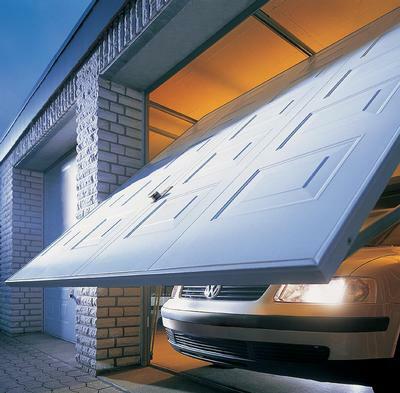 The up and over door, is probably the most popular type of garage door, with a choice of Canopy or Fully Retractable door gear, available in 38 standard sizes from the Hormann range of garage doors. Options include Steel, Timber, GRP or PVCU, steel doors can now come in a range of factory finished colours, or decograin wood effect finishes in Golden Oak, or Rosewood. ( no more painting). Doors with canopy gear are for manual operation, and come in a range of standard sizes, or can be purpose made for non standard sizes, up to a maximum size of 8`0" wide x 7`0" high. Fully retractable doors are suitable for both manual or electric operation, and are available in widths up to 14`0" wide x 7`0" high. Options include, steel fixing frames, glazing, inset wicket doors, aluminium handles in a choice of colours/finishes, 4 point locking for extra security, bottom rubber seals and open for infill doors, so you can clad the door with timber to your own design. 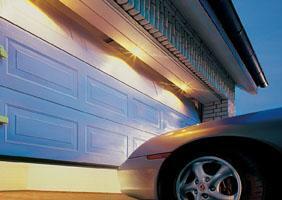 The Hormann sectional Garage Door offers the home owner a few more advantages over the up and over garage door. A greater level of security, a door which is fully rubber sealed all round, fully insulated versions, full opening width and height when the door is open. Sectional doors are available in steel embossed woodgrain finish, a smooth silkgrain finish, a decograin wood effect finish in Golden Oak or Rosewood, or real timber in Nordic Pine or Hemlock. A big range of standard sizes are available in both imperial and metric, up to 5500mm wide and up to 3000mm high, or can be purpose made to suit any non standard size in between. Sectional doors are perfectly balanced for manual operation, are ideal for electric operation, or can be converted to electric operation at any time. Hormann sectional doors are available in single skin steel, double skinned 20mm thick or double skinned 42mm thick insulated steel versions. Options include glazing, inset wicket doors, different track arrangements, dozens of paint colours and a host of safety features. 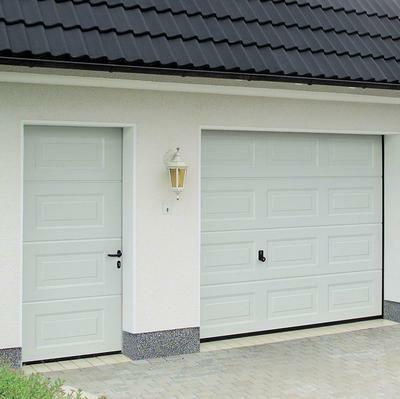 Rolling garage doors are becoming increasingly popular, are space saving, electrically operated as standard, all rolling doors are purpose made to suit the opening, to give a full clear drive through width and height. 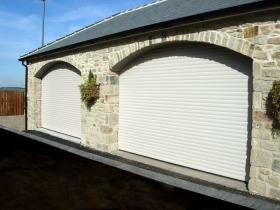 Rolling garage doors are available in a choice of colours and wood laminate finishes, eliminating the need for painting and only requiring an occasional wash down, ensuring your garage door will continue to look good for many years. In two standard types, "Compact" for single doors or where headroom is limited, and the "Ultimate" with the bigger slat for a more robust door and larger sizes. Standard equipment provides each door with an internal manual override, a wall mounted receiver and courtesy light, manual push button panel, two remote control hand transmitters, photo cell safety beam, brush lined guides for a smooth and quite operation, bottom rubber strip and automatic lock down. An external manual override facility is also available, where there is no other entry into the garage in event of a power cut. For the very best in rolling garage doors, Hormann now offer their new "Rollmatic", ask for a brochure. Steel side hinged garage doors, are ideal where a lot of constant access is required, are safer and easier to use by children needing their bikes and so on, than an up and over door. These doors come complete with their own steel fixing frame, lock and shoot bolts, are outward opening, and are made as either equal pairs or as a 1/3 and 2/3 option. With 18 standard sizes available in Vertical Rib design, 12 standard sizes available in four Georgian Panel designs, or purpose made sizes up to a maximum 8' wide x 7' high (2539mm x 2196mm). Steel swing doors come in a range of factory paint finished colours, with White as standard, optional Brown (Ral 8028), Blue (Ral 5005), Dark Blue (Ral 5011), Green (Ral 6005), Red (Ral 3003) and Black (Ral 9005). Side hinged garage doors are also available in GRP (glass reinforced polyester), timber and a range of sizes are also readily available. Reliability, maintenance free, patented automatic locking and self adjusting toothed drive belt, faster opening and a 5 year guarantee, are just some of the features of these quality garage door operators. The ProMatic is a no frills, competitively priced garage door operator and is ideal for automating single up & over or single sectional garage doors. 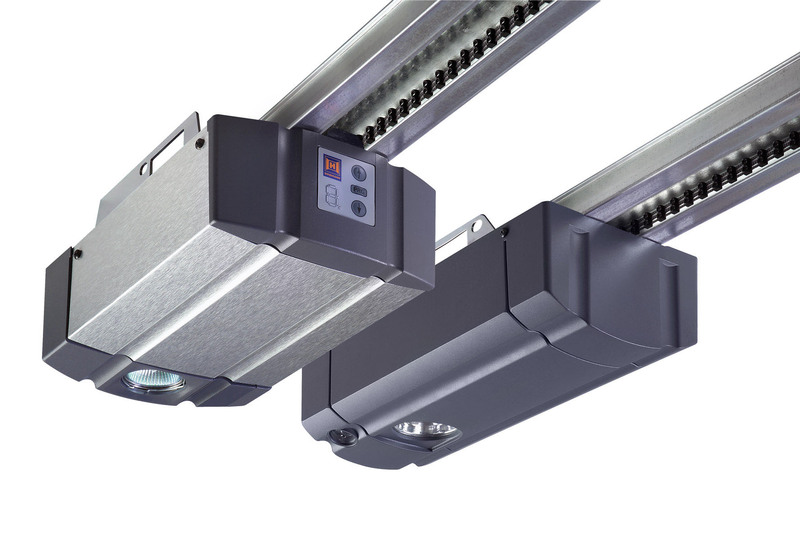 The SupraMatic is a heavier duty version and has some unique features, with integrated operating buttons, and is particularly suited to larger and heavier garage doors, opens them with ease. The range also offers, garage door operators for doors with a more frequent use, as in underground car parks, and very heavy doors to which some other operators may struggle. There is now a vast range of transmitters to operate your garage door, from conventional hand transmitters, to push buttons that fit into the cigar lighter, key switches, push button key pads, transponders, and even fingerprint recognition. 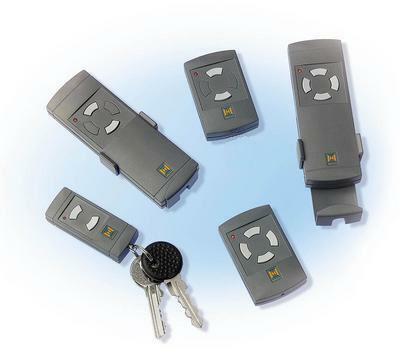 Hand transmitters can operate up to four separate doors individually, or can be programmed to operate both the garage doors and an electric gate system, by installing a compatible receiver. Quality brochures are available, showing the range of motors, the features and benefits, along with the transmitters and other means of opening your garage door. If you are constantly searching to express your aspirations, the Hormann domestic front door range could possibly provide the solution. Exceptional quality and security come as standard features in all of these products, which are built to last, maintenance free, and look beautiful year after year. The doors come in 3 different types of construction. 1. "TC" stands for the Top Comfort, where the door panel is in aluminium, and fitted within the door leaf frame, giving the effect of an inner and outer frame. 2. "TC" with UPVC, is the same construction as "TC" but with a UPVC design panel. 3. 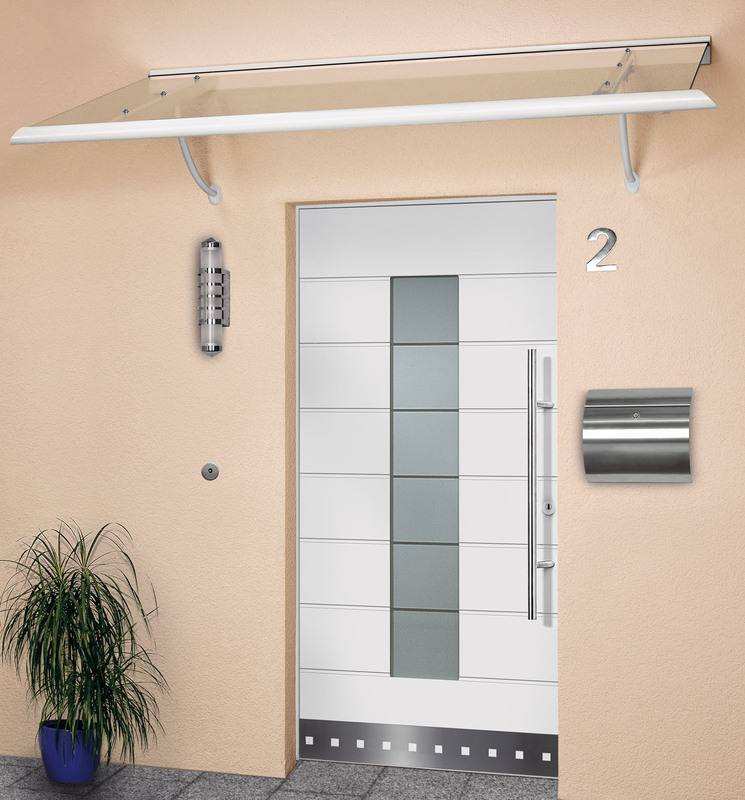 "TP" stands for "Top Prestige" construction, an aluminium design panel that covers the door leaf frame so that from the outside, you see only one frame. The TP can also be embellished with a rounded edge profile, which further enhances the design of the door and is the top of the range. Hormann front doors are available as solid panel doors, or can include glazed panels in a range of stylish glass finishes. You can choose from standard white RAL 9016, or any standard european RAL paint colour, finished off with a stylish handle of your choice, to create a crisp look and a unique design, to enhance or in keeping with the style of your property. 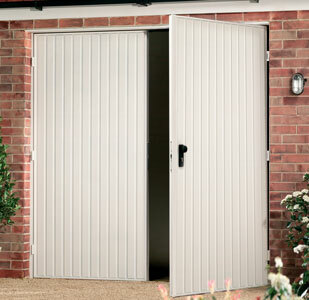 Side doors are in steel, strong, secure and maintenance free, available in a wide range of styles and sizes, either to match your new garage door, or whether you are just replacing on old existing timber side door. The accompanying photograph demonstrates how a matching side door, can compliment the main garage door and transform the looks to the front of your property, the raised panels of the garage door leaf and the side door in the picture, shows they are perfectly aligned. Options for side doors, include glazing, attractive handles in aluminium, and are available factory paint finished in a range of standard european RAL colours.